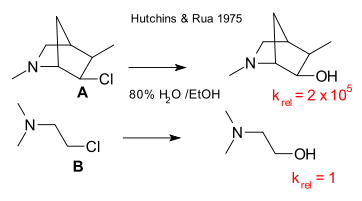 In an example of a nucleophilic substitution reaction a nucleophile (Nu) reacts with an organohalide R3C-X to form the substituted product Nu-CR3. In conventional transition state theory this takes place with simultaneous bond making and bond breaking and on the reaction coordinate with decreasing nucleophile to carbon distance the intermediate structure Nu-C-X called the transition state lies at the top of an energy hill. In an analogy with simple stapler action (the staple will only start piercing the paper when the force needed to bend the metal is overcome), the hill commanded by Nu-C-X is now replaced by a plateau with Nu//C-X as one extreme (Nu has reached critical distance to C) and Nu-C//X as the other extreme with a barrier less and extremely fast interconversion. With catastrophic events comparisons are made with melting and micelle formation. It can be added that in modelling chemical reactions the cooperative actions of several dozens of molecules need to been involved for a plausible result. But are there practical consequences to this theory? M&K think so when certain intramolecular substitution reactions are considered with the reactants in close proximity and beyond the critical Nu/C-X distance. For this type of reaction the singularity concept predicts faster than usual reaction kinetics. This is especially relevant to the so-called better-than perfect enzymes ,one of those unsolved problems in chemistry. But is it all entirely new? Many theories already exist that have different wording but boiled-down possibly mean the same. In the classic organic chemistry textbooks a fast reaction is characterized by a so-called early transition state that resembles the reactant (Hammond's postulate). In another theory enzyme reactions are fast because for instance protons tunnel themselves a way through an energy barrier. To add to the confusion Menger himself introduced the so-called spatiotemporal effect (not just close proximity but sustained close proximity) in 1985 (DOI) that is just one of several theories that Menger again summarized in 1998 (DOI). One of the reactions that according to M&K exemplifies the new singularity concept is the strikingly fast solvolysis of an 6-aza-4-chloro-2.2.2-octane compared to that of N,N-dimethylamino-2-chloroethane first observed by Hutchins and Rue in 1975 (DOI). In their analysis the general effect introduced with nitrogen can be attributed to Neighbouring group participation when the nitrogen atom helps pushing out the chlorine atom. In addition in the bicyclo compound the orientation of nitrogen is much more favorable and reaction is faster in spite of unfavorable steric strain effects. No singularities there either.